Danny Wilson is not happy about the Checkatrade Trophy, its rules, organisers and the attitudes of some big clubs towards it. 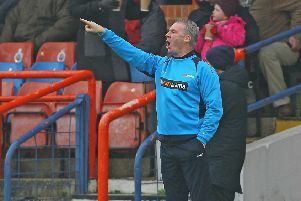 The Chesterfield manager says the competition isn’t set up fairly for clubs like his who adhere to the rules. And he doesn’t feel the new rules, supposedly brought in to allow youngsters at Premier League and Championship clubs to gain valuable competitive experience, are working. “I don’t know what they want from it. I don’t know what the organisers want,” he said. “If it is to promote young lads then they’re not getting that, not when you see the teams put out at some clubs this week. “It isn’t fair, I’ve seen teams not putting full teams out, taking the fine I suppose. “We do all the things we’re asked to do in the rule book and it gets overlooked. “It’s been a frustration from my point of view. The Spireites are still in with a shot of a Wembley appearance having qualified for the knockout rounds, where they’ll meet Rochdale away from home. But the inclusion of bigger clubs, albeit through their Under 23 sides, has devalued what was previously a competition with fond memories for Town. “Of course it’s devalued,” he said. “I’m only looking at the stats of the personnel who have been playing. “Look at Stoke, reportedly with £31million worth of talent in their team the other night. How is that fair? “If it’s going to be Under 23s and they want players to get experience then they should play Under 23s. “They’ll turn round and say we’re allowed to play five overage players, of course you are but that’s not really what the competition is about. It’s about putting the young lads in. The Wembley carrot is in danger of being whipped from under the noses of League One and Two clubs according to Wilson, who doesn’t believe younger players will be given a chance by big clubs in the latter stages. “It’s always a chance for the lower clubs, but when we’ve put Under 23 teams in there, can you see big teams seeing Wembley round the corner and not putting first team players in there? I’m not suggesting any team but a Championship or Premiership club, two games from a final, not putting their best team out? “That’s to the detriment of the competition, it certainly doesn’t help lower league teams getting to the final. “We’re playing by the rules and I don’t think others are. I don’t think that’s fair. “Clubs are taking advantage of certain things.